Archangel Gabriel/Gabrielle through Shanta Gabriel (1) this month contains a passage I found extraordinary. It harked back to something that Archangel Michael said to me on May 27. In an Ascension ethnography, the topic of the process by which our light bodies are brought online has an important if little understood place. “When you are ready for mastership — living in your most Divine Self while in human form — that is when your soul opens to receive a special quality of consciousness from the Archangel who is called. Your whole body responds to this essence in pure acceptance, and your energy system opens to the rewiring necessary for divinity to transform you from the inside out. “A new rainbow Light Body is being created within your energy system that has the capacity to hold higher frequencies and live in harmony with the Earth at the same time. “The Archangels have been tapped by Divine Intelligence to work with those souls on the earth who are willing to walk with them on a new journey of Oneness. 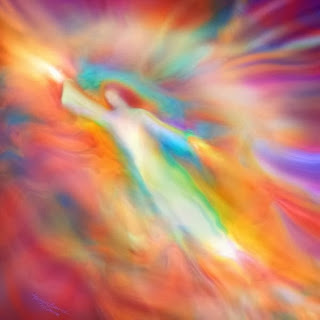 It is not that Angels are the only path to ascension, but these beings of Divine Light are offering to ease the way for you and bring forth a new level of freedom so you can express your highest divinity in fulfillment and alignment with your soul’s destiny. “It is important for you to know that in this time, during this frame of reconstitution, rebuilding, re-gridding, re-anchoring into a broader spectrum – that is about one of the best ways we can explain it – that your beingness has expanded and your body is accommodating, adjusting, getting ready to fully step forward into a new realm of existence. “Yes, it is the new realm of existence of Ascension but it is also the new realm of existence of Terra Gaia, of humanity, of a new way of being upon this planet in tandem not only with each other but with the seen and unseen kingdoms with your star family. So, in our ethnography of Ascension, we need to take note of this rewiring or re-gridding that’s necessary if our lightbodies are to be activated and brought online. Of course there’s no opportunity to know more about it from our own experience until we’re a ways further down the road. But we can make note of the subjective experience of going through the events of this phase. There is the invitation, folks. The archangels and the angels want to help us refine our vibrations. They want to work with people in the activation of their lightbodies. They want to produce leaders. The more people who take the leap, the lighter the planet becomes. (1) As far as I’m aware, archangels don’t have gender. In my understanding, gender is associated with male and female procreative organs and archangels neither have them nor procreate. But that’s simply my guess. (2) Messages From Archangel Gabriel – With Shanta Gabriel. June 1, 2016. 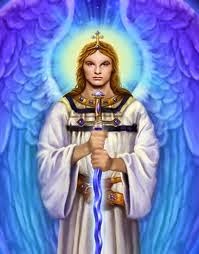 (3) Archangel Michael in a personal reading wth Steve Beckow through Linda Dillon, May 27, 2016. Used with permission.